Dillon Whitney, 10, collected donations at a lemonade stand to give to the American Red Cross. Hearing about hurricanes Harvey and Irma and the destruction they caused, Dillon Whitney decided he wanted to help. The 10-year-old Burnham resident used his free time this weekend to run a lemonade stand at the Clinton Lions Agricultural Fair to raise money for hurricane relief efforts. Whitney has raised $391 and counting — all of which he donated to the American Red Cross at its office in Bangor on Monday afternoon. In Florida, Hurricane Irma snapped miles of power lines, toppled construction cranes and caused heavy flooding as far north as Jacksonville. It’s expected to continue into Georgia, Alabama, Mississippi and Tennessee. While no deaths in Florida were immediately linked to the storm, it killed at least 24 people in the Caribbean. 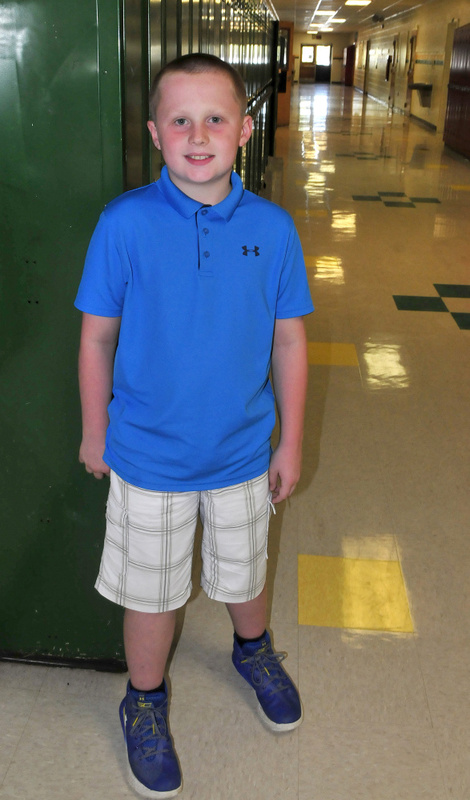 “It feels a little bit better” to be able to help people, Whitney said in an interview at Warsaw Middle School in Pittsfield where he is a fifth grade student. Whitney set his stand up in front of his grandmother’s business at the fair and sold a variety of handmade treats, including lemonade, fudge and cookies. Some people also found out about the fundraiser on Facebook and sent donations that way, he said. Whitney has been holding fundraisers for about four years, he said. In the past, he’s raised money for brain aneurysm awareness and amyotrophic lateral sclerosis, or Lou Gehrig’s disease, as well as a fund that sends kids to camp with the necessary supplies, according to a news release from the American Red Cross in Maine. He heard about the hurricanes when one of his mom’s Facebook friends posted that they were affected. The fundraisers are a family effort, he said, and even his 5-year-old sister pitches in. Whitney said he plans to continue raising money for different issues as he grows older.